Life on earth is facing unprecedented challenges from global warming, war, and mass extinctions. The plight of seeds is a less visible but no less fundamental threat to our survival. Seeds are at the heart of the planet’s life-support systems. Their power to regenerate and adapt are essential to maintaining our food supply and our ability to cope with a changing climate. In Uncertain Peril, environmental journalist Claire Hope Cummings exposes the stories behind the rise of industrial agriculture and plant biotechnology, the fall of public interest science, and the folly of patenting seeds. She examines how farming communities are coping with declining water, soil, and fossil fuels, as well as with new commercial technologies. 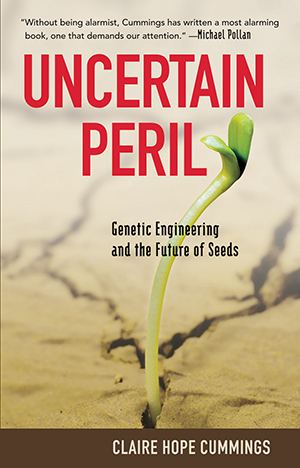 Will genetically engineered and “terminator” seeds lead to certain promise, as some have hoped, or are we embarking on a path of uncertain peril? Will the “doomsday vault” under construction in the Arctic, designed to store millions of seeds, save the genetic diversity of the world’s agriculture? To answer these questions and others, Cummings takes readers from the Fertile Crescent in Iraq to the island of Kaua’i in Hawai’i; from Oaxaca, Mexico, to the Mekong Delta in Vietnam. She examines the plight of farmers who have planted transgenic seeds and scientists who have been persecuted for revealing the dangers of modified genes. At each turn, Cummings looks deeply into the relationship between people and plants. She examines the possibilities for both scarcity and abundance and tells the stories of local communities that are producing food and fuel sustainably and providing for the future. The choices we make about how we feed ourselves now will determine whether or not seeds will continue as a generous source of sustenance and remain the common heritage of all humanity. It comes down to this: whoever controls the future of seeds controls the future of life on earth. Uncertain Peril is a powerful reminder that what’s at stake right now is nothing less than the nature of the future. "...More valuable, though, are her scathing critique of the scientists who have shielded this unscrupulous industry from public scrutiny and her call to return the discourse—and the control of our food supply—to the public domain." "…her description of the hit-or-miss nature of the genetic-engineering process—which studies suggest may be at the root of alleged health impacts associated with GMOs—will unnerve many. A firm but not strident attack on 'techno-elites' that raises serious questions about the way we farm." "...a persuasive account of a lesser-known but potentially apocalyptic threat to the world’s ecology and food supply—the privatization of the Earth’s seed stock… [Cummings'] authoritative portrait of another way in which our planet is at peril provides stark food for thought."